SAN ANTONIO — October 24, 2018 — A Southwest Research Institute team using internal research funds has made several discoveries that expand the range and value of a future Pluto orbiter mission. The breakthroughs define a fuel-saving orbital tour and demonstrate that an orbiter can continue exploration in the Kuiper Belt after surveying Pluto. 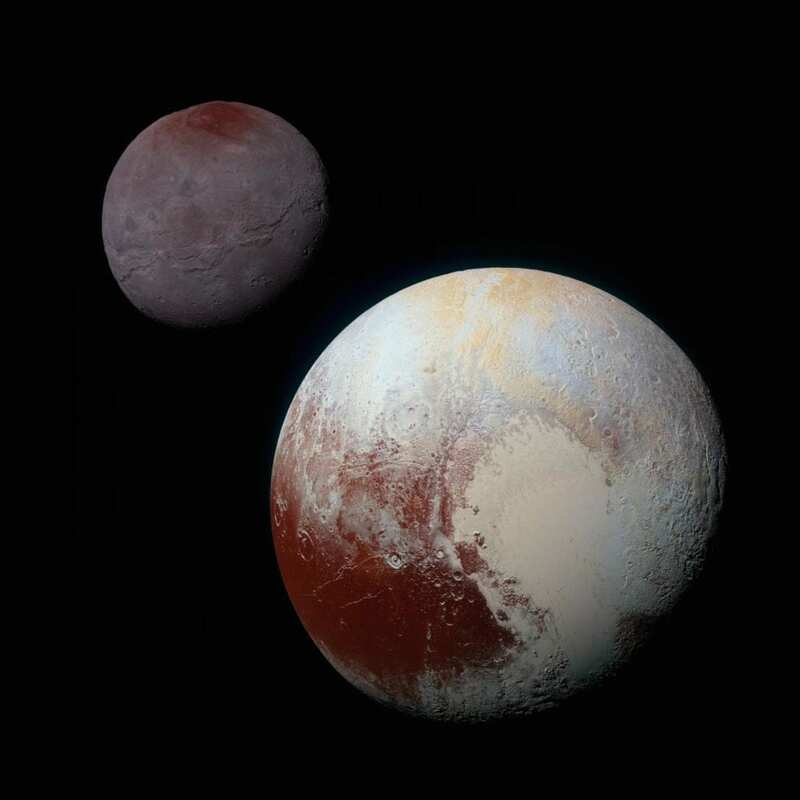 These and other results from the study will be reported this week at a workshop on future Pluto and Kuiper Belt exploration at the American Astronomical Society's Division for Planetary Sciences meeting in Knoxville, Tennessee. Associate Vice President and planetary scientist Dr. Alan Stern leads the SwRI study. The team first discovered how numerous key scientific objectives can be met using gravity assists from Pluto's giant satellite, Charon, rather than propellant, allowing the orbiter to change its orbit repeatedly to investigate various aspects of Pluto, its atmosphere, its five moons, and its solar wind interactions for up to several years. The second achievement demonstrates that, upon completing its science objectives at Pluto, the orbiter can then use Charon's gravity to escape the system without using fuel, slinging the spacecraft into the Kuiper Belt to use the same electric propulsion system it used to enter Pluto orbit to then explore other dwarf planets and smaller Kuiper Belt bodies. "This is groundbreaking," said Stern. "Previously, NASA and the planetary science community thought the next step in Kuiper Belt exploration would be to choose between 'going deep' in the study of Pluto and its moons or 'going broad' by examining smaller Kuiper Belt objects and another dwarf planet for comparison to Pluto. The planetary science community debated which was the right next step. Our studies show you can do both in a single mission: it's a game changer." The team also includes spaceflight engineer and mission designer Dr. Mark Tapley and planetary scientist Dr. Amanda Zangari, as well as project manager John Scherrer and software lead Tiffany Finley, all from SwRI's Space Science and Engineering Division. Finley designed the Pluto orbital tour around dozens of Charon gravity assist maneuvers. "This tour is far from optimized, yet it is capable of making five or more flybys of each of Pluto's four small moons, while examining Pluto's polar and equatorial regions using plane changes. The plan also allows for an extensive up-close encounter with Charon before dipping into Pluto's atmosphere for sampling before the craft uses Charon one last time to escape into the Kuiper Belt for new assignments," she said. Tapley's work demonstrated that an electric propulsion system similar to that used by NASA's Dawn mission could power the orbiter to allow it to fly to other known Kuiper Belt objects, including any one of a number of dwarf planets. "In fact, we found it is even possible to reach and then enter into orbit around a second dwarf planet in the Kuiper Belt after studying Pluto!" said Tapley. "Who would have thought that a single mission using already available electric propulsion engines could do all this?" said Stern. "Now that our team has shown that the planetary science community doesn't have to choose between a Pluto orbiter or flybys of other bodies in the Kuiper Belt, but can have both, I call this combined mission the 'gold standard' for future Pluto and Kuiper Belt exploration." The team will spend the next few months publishing more of their findings and determining the spacecraft system attributes needed to accomplish the "gold standard" Pluto orbiter-Kuiper Belt explorer mission. For more information, visit https://www.swri.org/space-operations-center.